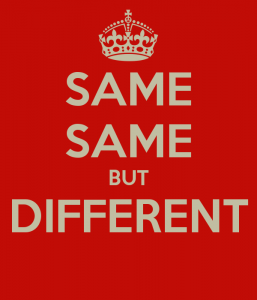 The iconic phrase “same same but different”, ubiquitously heard in the tourist areas of Thailand as well as other parts of Southeast Asia, is a metaphor I like to use to describe people and culture. While the versatile Tinglish expression is generally used in the context of justifying a higher price for something that may appear to be the same, yet is – or allegedly is – different from another product or service, it also exemplifies how we generally view our fellow human beings. As I have pointed out before in my Paris TEDx Talk, there is a tendency amongst people of good will to rely on the belief that we as human beings are more similar than different. We like to think that despite some superficial differences in the form of appearance, customs and behaviors, deep down we are all the same – human beings with the same core needs, values and desires. Our innate longing for connection, belief in spiritual oneness, and on the other hand a tendency towards superficiality, all easily lead us to find comfort in such beliefs and assume similarities even at the socio-cultural level. Yet how similar are we, actually, on this material plane of existence? Are there values that are shared across the globe? Do we have similar expectations or perceive and interpret things in the same way across cultures? Or is it simply that as humans we all experience similar emotions such as love, joy, sadness, anger or disappointment? •	Is it ethical or is it dishonest to expect your business partner to stick to the contract even when unexpected circumstances arise, rather than taking into consideration the underlying human relationship and changed circumstances? •	Is it respectful or is it rude to look at someone in the eyes when they are talking with you? •	Is a “limp” handshake a sign of weakness or of respect? •	Does the answer “yes” necessarily imply agreement or can it also simply mean “I hear you/I understand what you said/I can see this is important to you”? •	Do we approach a negotiation with a “time is money” attitude, or rather with the idea that the slower the negotiation, the better and the more trust can be built? Indeed the expectations and judgments around such situations can be very different if not polar opposite across cultures. In other words, we might be all be playing the same game in life, but the rules vary. So if we want to experience positive interactions, personal growth and business success in the global marketplace, let us avoid simplistic assumptions and instead truly learn to understand each other. Let’s step up our game and learn the different sets of rules so that we give ourselves the predictable opportunity to “win” in a variety of environments.